VMware Horizon Mirage not only acts as a layered deployment mechanism for centralized IT administration of physical devices, it is a comprehensive endpoint protection solution. Changes made to the endpoint device are synchronized with the centralized virtual desktop (CVD) on an hourly basis. These changes are then rolled up into snapshots. Each snapshot contains only the incremental changes to the original desktop image since the previous snapshot. This protects mission critical data for your business users which includes user-installed applications, user settings and data, and machine state. Execution is local to the device, and your business users can work online or offline; they are not tied to the network. The snapshots are automatically uploaded to the datacenter while users work without interruption. While a user is disconnected from the network, user changes to the endpoint are flagged for upload when re-connected. This gives IT professionals the ability to restore all or part of the desktop. The snapshots are done every 24 hours. Snapshots are rolled up to daily, weekly, monthly and yearly recovery points. By default it retains 7 daily snapshots, 3 weekly snapshots, and 11 monthly snapshots which are rotated automatically. 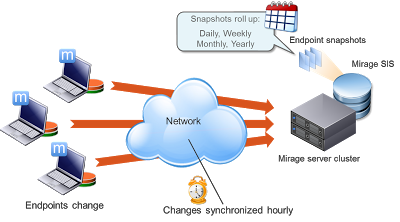 The snapshots can be customized in the system configuration of the Mirage server properties. When your business users are on a device that is being managed by the Mirage client, they have the ability to right click on a folder or document and restore files from the available snapshots. Lets look at a real world example of an endpoint recovery, one of the employees at your company has an endpoint device that fails and needs to have a replacement. He receives a new corporate laptop from the IT department. IT Support loads the latest base image with the correct driver profile. After the base layer has been assigned, Horizon Mirage then starts to stream down the remaining user files. What if the user has 100 GB of data to be restored? And we want the user to get back to work right away. Streaming allows the user to work before all of his files are download. Horizon Mirage doesn't download streamed files before boot, instead, it create stubs of these files. 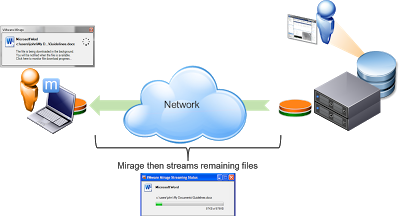 If a user or an application tries to open an offline file before it has arrived, the Mirage driver blocks the application and presents a warning, the Mirage service moves up the priority of the application and downloads the file through on-demand streaming, then when the download is completed, the application is released. Horizon Mirage automatically takes snapshots of the user desktop, which enables quick recovery or rollback to a previous desktop state. Changes to the endpoint are captured and periodically uploaded to the desktop image in the datacenter. Other products require an all-or-nothing desktop restoration; Horizon Mirage offers the option of restoring specific layers, while preserving the other layers. You can restore an endpoint to a previous snapshot without overwriting user data. If a computer is stolen, damaged, or lost, you can restore the entire computer to a replacement device, or restore only selected layers. Or you can temporarily migrate a physical computer to a virtual machine until a replacement device arrives. If the information on a computer hard disk is corrupted, you can overwrite the prior information and restore the desktop image to the same device. 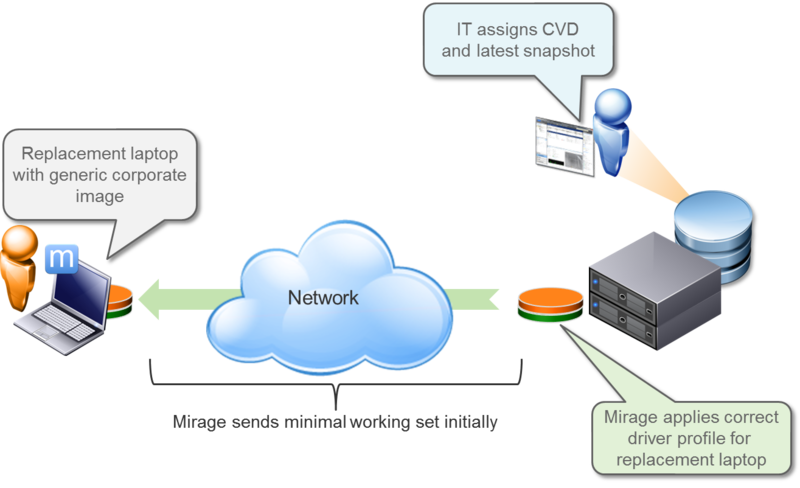 VMware Horizon Mirage provides businesses with the opportunity to centrally manage and control desktop images of their organizations computers; and provides centrally stored snapshots that allow IT support to recover partial or full desktops when needed. 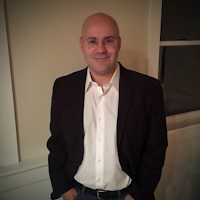 There is a paradigm shift that is happening in end user computing, it started when IT departments needed to support a growing number of diverse endpoint devices (including tablets), this new focus on re-inventing end user computing will help IT managers support the demands of their business users for flexibility and agility, while ensuring they don't burn out their already depleted IT staff. Mirage is a great addition to the Horizon Suite which includes Horizon View and Horizon Workspace.